Email marketing has always had ‘revenue power’ it’s the reason why spammers continue to make tons of cash and your inbox junk folder is full of pills, refinance offers, and random emails from African princes. These days email marketers continue to unleash smatterings of deployments to grow their company and garner revenue. With increasing eyeballs on email as a solid revenue driver it’s becoming harder to stand out among the crowd. It’s actually pretty simple — keep your messaging easy to understand, make your content informational, stop blathering about corp. marketing speak, and be helpful. Consumers don’t care about your latest press release unless they’re in it or it’s an investor update about how your company just made them a fortune. You’ll notice how nice it’s laid out and how obvious it is to figure out what they want you to do. It doesn’t hurt that the messaging is very beneficial to users who want help with finances and want reminders that maybe their bank doesn’t offer. I personally love this approach and it will keep me opening these emails going forward. What’s even better about this approach is the cadence of the email marketing. I’ve been a Mint.com user for a while now (years), it’s helpful. I’ve got all my notifications and alerts set up for my accounts that email me on a weekly sometimes daily basis. With that frequency I’d burn out super-fast if they lumped on another 1-2 emails a week. Mint.com has emailed me outside of my normal alerts just over ten times in 18 months. Every email has notified me of settings I’m not using in my account or of features that I’ll be interested in – like the email above. How Can I Use This for My Email Marketing? I challenge you to peel-back the frequency, educate more often, and be aware of other departments in your company that are using email to communicate. Doing these three things along with the messaging tips above should help you get more relational with your email lists than you’ve been before. Remember; people don’t care unless you’re helping them. Sending more, reusing content too often, and weighing emails down with content isn’t helping anyone. Keep it simple, keep it safe (thanks Gandalf). Nice mailer – it’s an awesome service too! 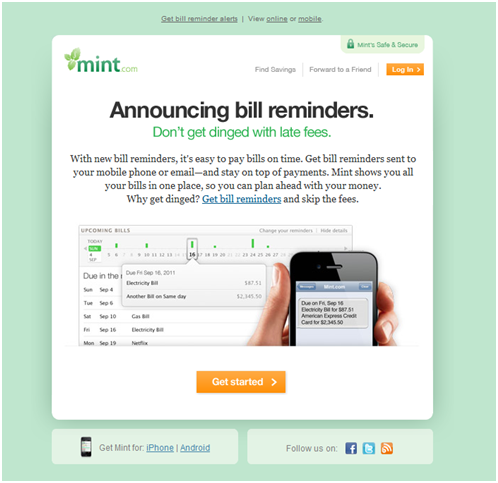 I’m a long-time fan of Mint emails. They do a great job.